Everyone loves John Lewis - old school bastion of the department store, likely home to the majority of wedding lists you have bought from and the failsafe for wax jackets and Aga-friendly kitchenware. But for the hungry among us, the Oxford street store is branching out. Those who dare to desire more than a slice of Victoria sponge and a pot of tea may notice a couple of new food places as they make their way up the escalators from Cushions to Haberdashery. One of those is Ham Holy Burger, a relativity young Italian chain from the company behind several restaurant endeavours including Rossopomodoro, which unsurprisingly sits next door to it. The place has a simple aesthetic with modest wooden tables and chairs and checkerboard floors, whilst the cement plastered walls, neon signage and cutlery assembled in jam jars insist that it is also a bit edgy. Easy now, this is John Lewis remember guys. The edge doesn't stop there, as the chatty waitress who led us to our table placed down not only a paper menu but an iPad, which also included the menu. She explained that ordering was done on the device and that, while she would love to actually serve us, her role was primarily one of delivery mechanism. 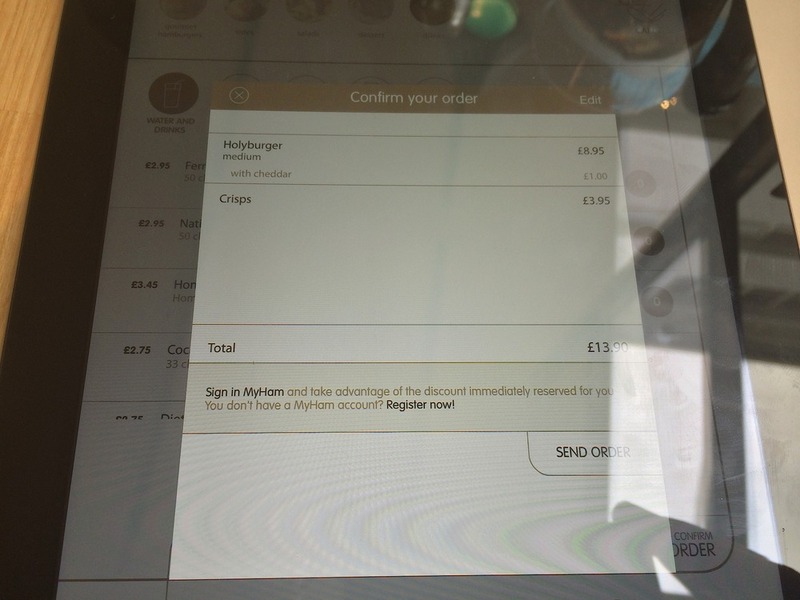 Not only could you order but also completely ignore your fellow diners and 'surf the net' whilst waiting for your food on the unlocked Apple product, a facet a pal of ours exploited with rib-tickling results. Our frantic Buzzfeed browsing was short-lived, as the Holyburger with cheddar arrived quick sharp. The bun arrived as glossy as a well-moisturised Kardashian, with hunks of tomato, red onion and cucumber spewing out atop the patty. The traditionally reared, double-muscled Piedmontese beef was cooked to a solid medium with lots of pink on show and a half-decent char on it, yet was absent of any meaty burst of flavour and seemed void of seasoning. The cheddar melted on top had a nice rubbery pull but was a sparse thin layer which lacked impact on the gob buds as well. The burger was partially bolstered by a decent bun with a buttery toasted crust inside, and an interesting sauce with was rich and sweet - kind of merging ketchup and barbecue sauce with a hint of Southwestern. But the intrusively raw onion and cucumber chunks that partnered the lettuce and tomato were a weird, too-chilled and too-crunchy experience. Ham Holy is to McDonalds what Pizza Express is to Pizza Hut: Some people like their ham sliced and their sausage spicy, with the ability to pour half a kilo of bacon bits over heavily-mayonnaised potato chunks and call it a salad. Others prefer 'refinery' and desire their marinated santos tomatoes nonchalantly tossed upon pizza bases by stoic chefs dressed as Jean Paul Gautier extras. With ingredients as grandiose as smoked Scarmoza cheese and oregano seasoned aubergine carpaccio, Ham Holy are hammering home the 'gourmet' here. And charging four quid for crisps, lovely as they were, hammers home the slightly steep price point too. As a concept Ham Holy will suit the John Lewis crowd down to a tee. You'd happily take your mum there as a rest bite during the yearly trip out for new drapes. But for us, a religious experience it was not.